Address & other details: If u r going towards Ashram from AIIMS end, cross Moolchand underpass , go straight, take a U turn from the next flyover, keep coming towards Moolchand , Gupta Market is to ur left. 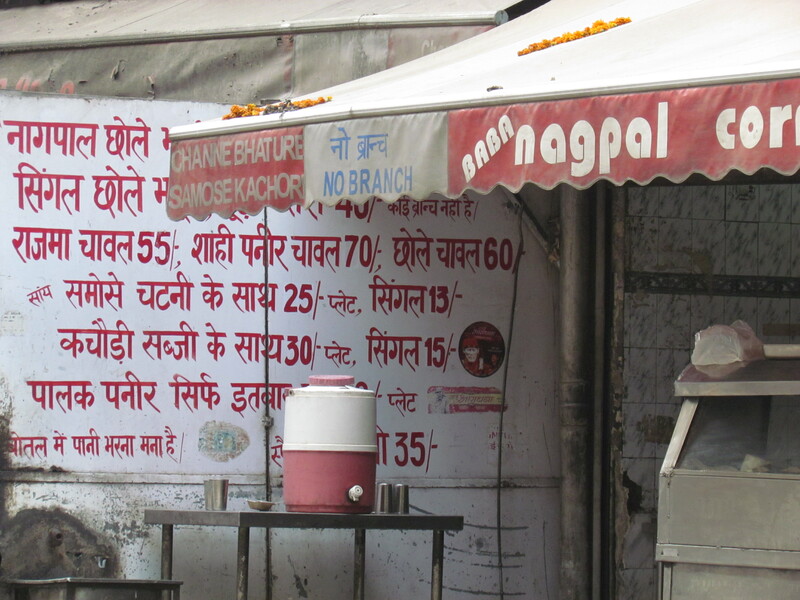 If lost, use Indian GPS – ‘Bhaiya ji Nagpal ke choley bhature wali dukaan kahaan’? Everyone in the area seems to know. 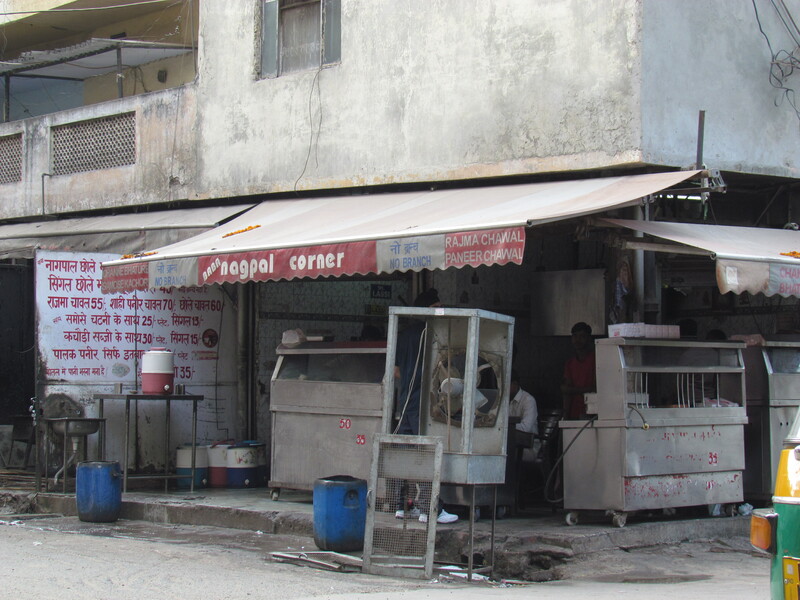 After an intense week with five 1 hour workouts each day, crazy yummraj drove 45 km (up-down) on a Saturday morning to eat calorie-ful Chholey bhatureat Nagpal’s corner, lajpatnagar. Here is the story of what happened. As mentioned above, it was pretty easy to locate the place. We read that the shop opens at 7.30 am. Reached there at 7.45 & was expecting massive parking issues & crowd & queues – based on our earlier experience at Sitaram Dewanchand. We were pleasantly surprised to see that there was ample parking space, no queues & empty tables. I am sure during the day this place is jam packed. 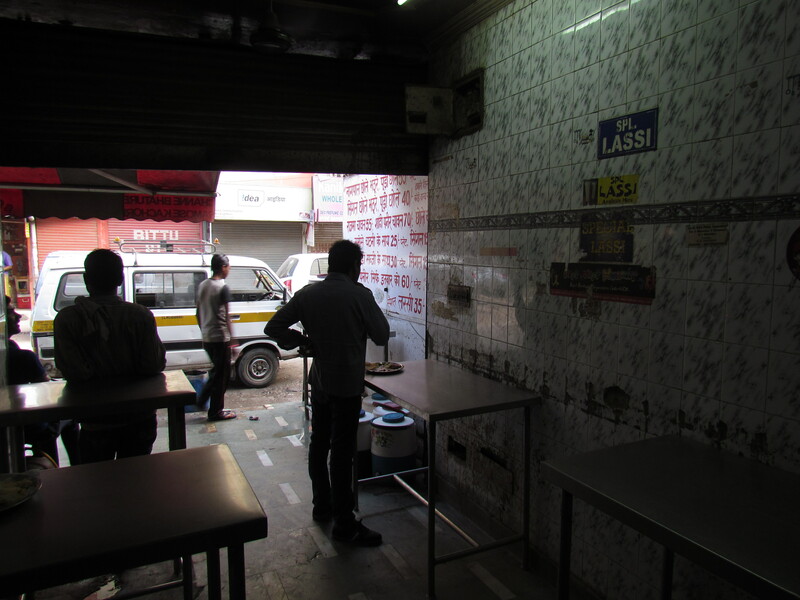 The shop is actually a huge open kitchen with a small eating room beside it. The eating room has high tables with no chairs. Customers r supposed to pay at the counter & carry their food from counter to one of the tables & stand around it & eat. 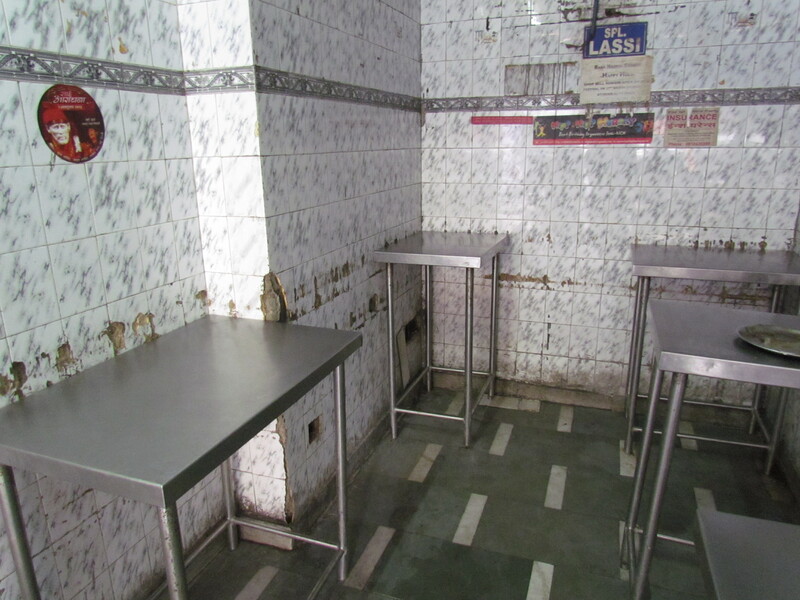 The eating room had low maintenance tiles on the wall & metal tables. A huge hand painted menu card was there outside the shop. The look & feel of this place was much inferior to the much more organized & neat & clean Sitaram Dewanchand. 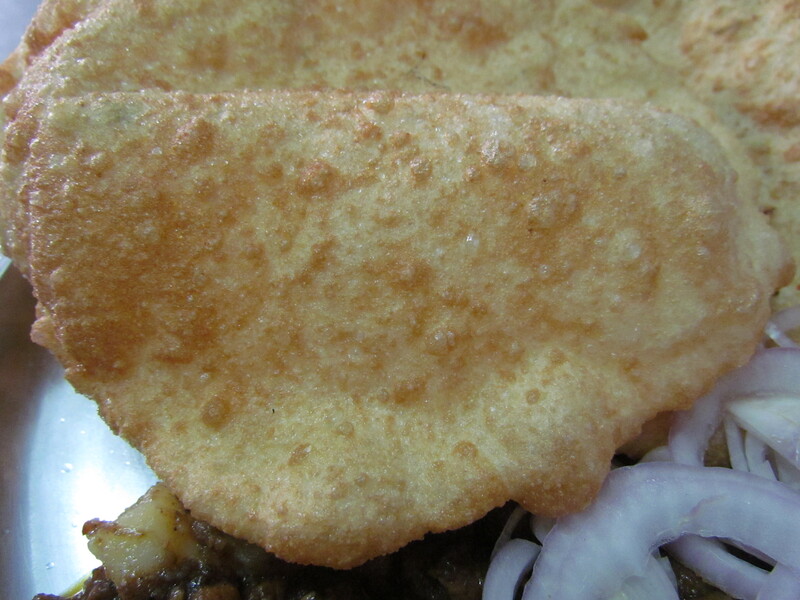 In the morning they just serve chholey bhaturey & chholey puri. During the day there r many more items available. 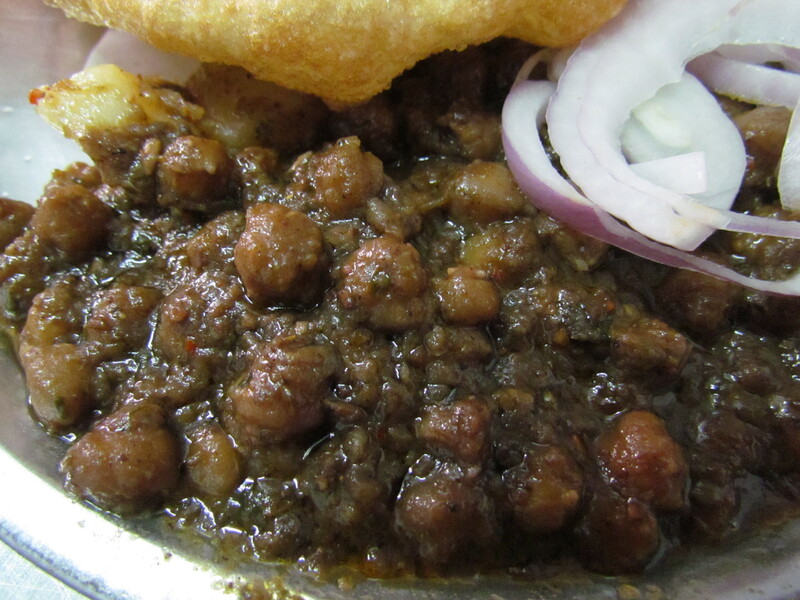 We opted for Chholey Bhaturey. The Bhaturey had no salt in it, neither did it have the fermented flavor or for that matter any other flavor. We cud see some crumbled paneer and green chillies inside it but that did not impact the taste. 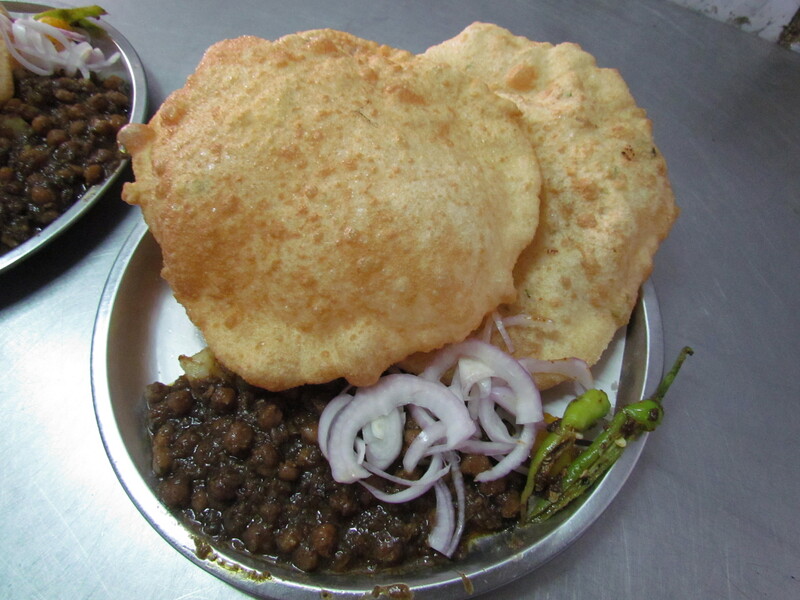 The bhaturey were however mammoth in size & I was struggling to finish 2 of them at a go. They were very soft and remained so till the end. Liked it & rate it 3.5/5 I surely liked the bhaturey at Sitaram Dewanchand better. Chholey bhaturey, slices of onion, pickled green chilly, pickled amla. The Chholey were soft but firm and in perfect texture. It had a robust, rustic & impactful flavor & taste. Anaardana added nice daanedaar feel to the dry gravy of the chholey. Super loved it & rate it 4.5/5. Rating of food (breakfast) at Baba Nagpal’s averages out to 4/5. I liked it & wud surely like to revisit to try out more options during the day. Om Sweets is just as nice! thanks for sharing ur views, Anon.